Surely the most exclusive hotel in Sri Lanka, definitely the unique resort dedicated both to wellness and gastronomy, actually the sole five-star all-inclusive offer on the island. We couldn't discover the splendors of Kandy and the tea-plantations without experiencing what we would define as “a Paradise in Paradise”. 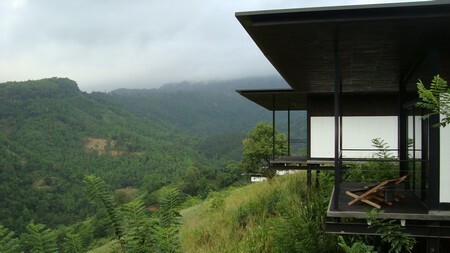 It takes a one-hour scenic journey from Kandy to reach this secret retreat. 23 kilometers on a picturesque national road, then on a straight, ascending regional road, leading to a bumpy path through a totally local, so picturesque area. Our driver stopped our sedan and said: “-Didn't we lose our way?”. A way to hell for him, obviously... But what a pleasure for the visitor. 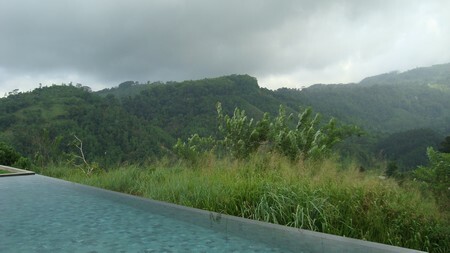 With gardens all around, and a breathtaking view of the green mountains. A last, hard to see street sign designated our final destination after this short rally. Welcome at Santani! The first impression getting our of the car was physical: feeling like breathing natural oxygen, mixed with the distinctive fragrance from the neighboring tea-plantation. Something unique. Pollution and noise, aggressivity and wars, totally forgot this portion of the planet where, to quote Baudelaire: “There is all order and beauty. Luxury, peace and pleasure”. We already understood that a one day break at Santani would not be enough to fully enjoy a tenth of what it had to offer. Average stay there is 5 days until one week. Or more. But visiting Sri Lanka without dropping our luggage in this sanctuary would have been a nonsense. A quality traveler cannot neglect the best of a destination. Making Santani an absolute must. 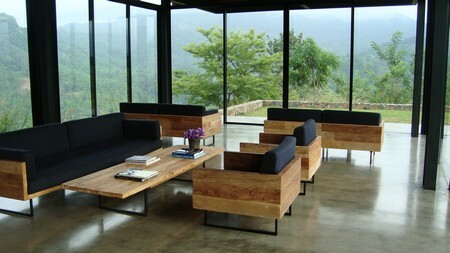 The place has been designed such a way, that it doesn't look like a hotel at all. There is no lobby, but a short reception pavilion which we didn't even visit. We handled our passport, filled a quick form, and can't tell more, as we totally forgot the check-in procedure. Instead, we remember the warm welcome by Manish Khede, the young and friendly general manager. Trained in the best resorts of India and Emirates, by Oberoi and Relais & Château, he is the captain aboard this luxury vessel over the mountains. Managing a team of Ayurvedic specialists (including one doctor), the best French restaurant in Sri Lanka, and an active army of almost invisible staff, he deals every day with the happy 1% of the planet, escaping their CEO office and limousines to enjoy the real luxury: doing absolutely nothing! 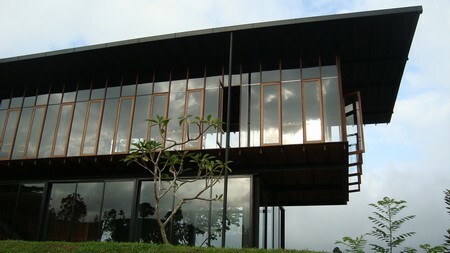 The resort features 16 stand-alone houses, called “Ambalamas” (places of rest). Large, providing a minimalist design, with prime quality bedding, a most pleasant bathroom featuring eco-responsible toiletry, they offer the best luxury ever: fresh air from the mountains (no air-conditioning), silence (no TV), peace (Internet is complimentary, but only on request; Santani is the place to treat your electronic addictions), and a million dollar view of the nature, mountains, waterfalls and wildlife. It is spectacular. We can't find words to describe it at sunset or sunrise. Heaven can't look nicer. Ideal for writing, creating, meditating... or simply sleeping, there is something typically monachal in those “Ambalamas”. Ours was close to the restaurant, not far from the entrance of the resort. We liked the orientation. 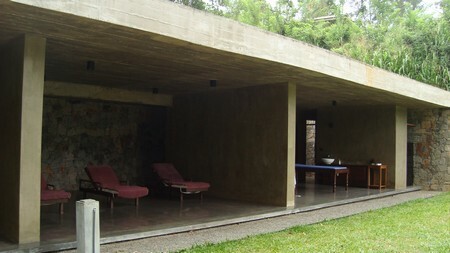 The houses closer to the pool may provide the sensation of being even more isolated; sheltered in a Buddhist monastery. There is indeed something sacred in this resort. Feeling like in another dimension, we captured happiness and inspiration as soon as we stepped in our large terrace, sitting in a sunbed, looking the clouds flying slowly over the valleys before they enrobed us with a humid lightness. This was one of the peaks of our stays in Sri Lanka: being hugged by the clouds... Something unique. Lots of resorts in the world are SPA/wellness by the adjunction of a basic massage room with a Jacuzzi. But Santani is rather like a SPA with a connected resort. The treatment area covers such a large area. Just like all the new generation of resorts, it has been designed in a severe concrete structure opening on nature. Most of the treatments are provided al fresco. The rooms are connected to the environment. Like in the bedrooms, the architects actually created a real impression of luxury through a minimalist design. What makes the difference is the nature... and the hands of the masseuses and masseurs, managed by the in-house ayurvedic doctor Sooral Ravi. Years of experience in his country, India, and in resorts overseas, make his diagnostic and treatments 100% conform to the original Ayurveda (hard to find in Sri Lanka, despite the omnipresence of “Ayurvedic spas” each street corner). Most of the guests book a SPA package, all-inclusive on room, treatments, and food. A favorite, the “Santani Recovery” plan, helps people who have undergone traumatic experiences, through holistic wellness and healing, detox and cleansing through nutrition, yoga, meditation and body work. 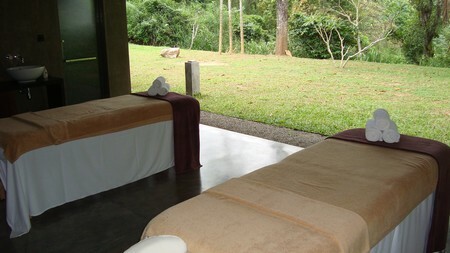 The classic “Santani Personal Dosha Ayurveda Retreat” is a must for those interested in a complete range of treatments. Time doesn't count, with 7 till 1 days available for your retreat? So do not hesitate, and book the customized “Santani Detox”: it will cost you little bit more than USD 6000 per person for three weeks, to clean your body of illness causing roots, rejuvenate your immune system...and have a daily three meals access to the best French restaurant in Sri Lanka (all-inclusive, exception of liquors). 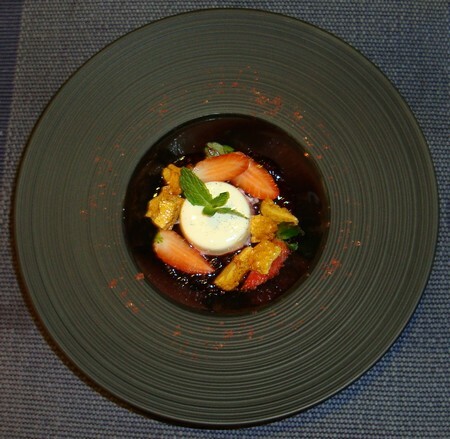 Though the ayurvedic treatments usually come with a prescription of quite a strict raw food / vegetarian regime, most of the guests can't resist the tempting French specialties by the friendly and passionate Chef Wajira Gamage. A native of Sri Lanka, he came back to his country recently with a French inspiration... and accent. Sixteen years in Paris, feeding the politicians, show business, movie stars, and CEOs patronizing the legendary “Café de l'Alma”, gave his cuisine all the qualities of a Michelin star chef. Chef Wajira unique, elevated restaurant, located in the observatory where each table has a breathtaking view of the mountains, provides weight-loss, rebalancing options, tailored-made for each guest. No one would receive -or select- the same breakfast, lunch or dinner menu. There is low carb diet, Keto diet and, for us, French gourmet, a special gourmand not-so-diet dinner with “Aubergine Dip” (savorous with some original French “baguette”), mouth watering “Crab Cakes Ranch Sauce”, a creamy “Corn Flour Soup”, a local “Modha Fish” (sea bass) served with a innovative Orange mustard sauce and “Bok Choy” Chinese cabbage, and paired with a fruity “Cono Sur Bicicleta, Sauvignon Blanc 2015, Chile”. After a “Trou Normand” (refreshing Tomato Sherbet), served in the middle of the service to clean our palate, we enjoyed a medium-rare, prime quality “Australian Beef Wagyu”, accompanied with Tamarin Sauce and a so sweet Pumpkin Purée, and paired with an aromatic “Cono Sur Bicicleta, Merlot 2015, Chile”. The best red meat we ever enjoyed in ten days spent in Sri Lanka. A pure delicacy. That was the highlight of our stay, together with the upgraded, actually gourmet “Sri Lanka Breakfast” by Chef Wajira, visiting his guests at their table during their all stay, from early breakfast until late dinner. 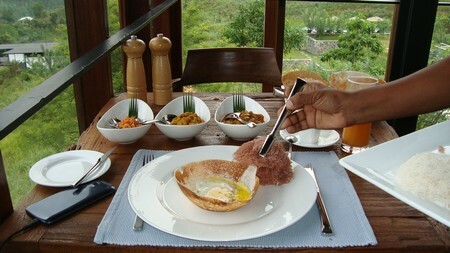 SANTANI WELLNESS RESORT & SPA: Arantenna Estate, Werapitiya, Kandy, Sri Lanka.